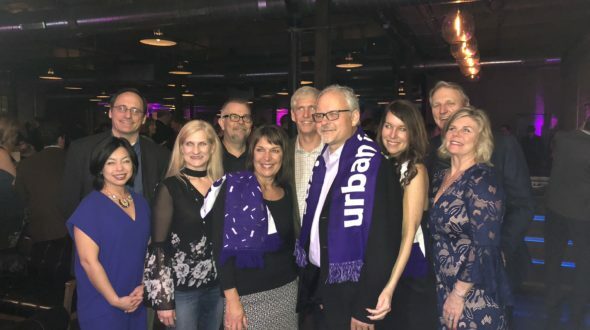 Urban Initiatives and Allstate Insurance hosted the 12th Annual Soccer Ball at Morgan Manufacturing on Friday, January 26, 2018. 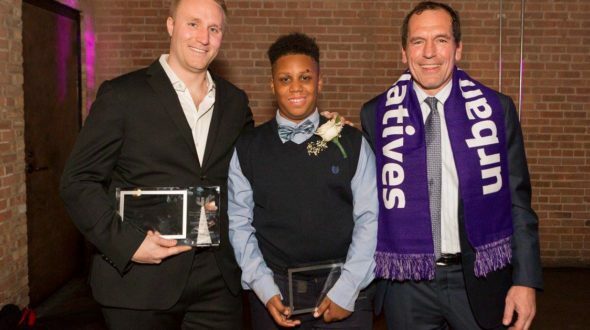 Featuring fundraising, dancing, soccer games, cocktails and delicious appetizers, Soccer Ball 2018 was a complete success. Over 1,000 guests including Chicago’s top philanthropic leaders, business executives, and family foundations joined in to celebrate Urban Initiatives and help raise funds for our continuum of programming. Over $465,000 was raised in ticket sales and sponsorships and $75,000 was raised through the silent auction which included amazing items such as Chicago Cubs owner Tom Ricketts’ personal seats, a vacation to Disney, an exciting getaway to Mexico, a Buddy Guy signed guitar, a hockey stick autographed by the entire 2017-2018 Blackhawks roster, a signed Mitchell Trubisky Bears jersey and much more! In addition, over $87,000 was raised during the Paddle Raise, which included an extremely generous match of $15,000 from William Blair. A total of $651,301 was raised and will allow Urban Initiatives to continue to empower our participants to become agents of change in Chicago Public Schools through academic success, healthy living and social-emotional learning. During the presentation, emcees Dionne Miller from ABC7 News and Mawi Asgedom of Mawi Learning helped to present several awards to our dedicated stakeholders. The Soccer Ball Award was presented to Northern Trust for their generous support since 2010. Through grants from The Northern Trust Centennial Fund and Charitable Trust, Northern Trust has enabled Urban Initiatives to grow from working with 1,000 students in 10 schools to over 17,000 students in 57 schools. The 2018 Paula Armstrong Memorial Heart of a Champion Award was presented to Jonathan Taylor, who has been involved with UI since 2014. His involvement on the Builders Board has allowed UI to build new connections within the Chicago traders community. He’s also the first to RSVP yes to every meeting, happy hour, and volunteering opportunity. He truly emulates the meaning of the Heart of a Champion Award by going above and beyond the call of duty in supporting Urban Initiatives’ work and mission. Coach Maureen Fernandez from Claremont Academy presented the Troy Cameron Team Captain of the Year award to the very inspirational 8th grader Larry Crowley. Larry has demonstrated leadership on the field and in the classroom at Claremont and has become a role model for his fellow teammates. Congratulations to all of our honorees and thank you for your continued support of the Urban Initiatives mission! Finally, Urban Initiatives would like to thank all of the amazing sponsors, host committee members, Board of Directors, Builders Board, Associate Board, and our wonderful guests including local business leaders, professional athletes, philanthropists, small business owners, lawyers, doctors, educators and friends. 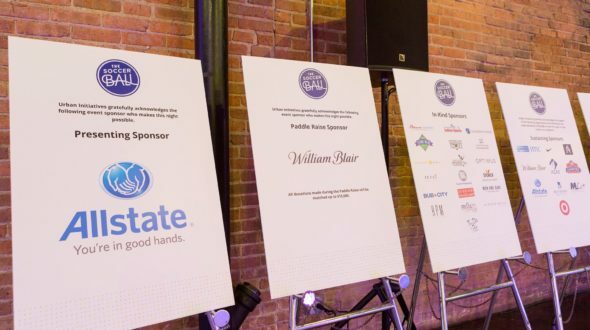 A special thanks to our presenting sponsor Allstate- their leadership in the Chicago corporate community and their dedication to Urban Initiatives programming is indicative of their commitment to building a brighter future for Chicago’s youth. Thank you to Lettuce Entertain You, Constellation Brands, Beam Suntory, Cubby Bear, Optimus and Sound Investment for making the logistics of the 12th Annual Soccer Ball a giant success. Thank you to everyone who attended and make sure to save the date for the 13th Annual Soccer Ball on Friday, January 25, 2019!